522 pages | 18 B/W Illus. This current, comprehensive history of American education is designed to stimulate critical analysis and critical thinking by offering alternative interpretations of each historical period. 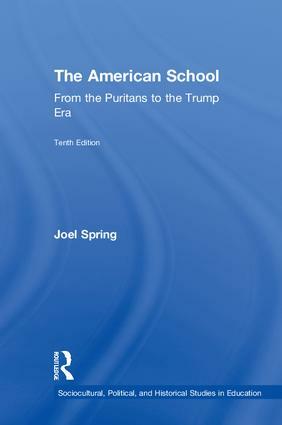 In his signature straight-forward, concise style, Joel Spring provides a variety of interpretations of American schooling, from conservative to leftist, in order to spark the reader’s own critical thinking about history and schools. This tenth edition follows the history of American education from the seventeenth century to the integration into global capitalism of the twenty-first century to the tumultuous current political landscape. In particular, the updates focus on tracing the direct religious links between the colonial Puritans and the current-day Trump administration. Chapters 1 and 2 have been rewritten to take a closer look at religious traditions in American schools, leading up to the educational ideas of the current U.S. Secretary of Education Betsy DeVos. An updated Chapter 15 further links traditional religious fundamentalist ideas and the twentieth century free market arguments of the Chicago school of economists to President Trump’s administration and the influence of the Alt-Right. —Randy Hewitt, Associate Professor of Philosophy of Education at the University of Central Florida. Historical Interpretations: Public Benefit or Corporate Greed? Should Commercial Radio or Educators Determine National Culture? American Schools: Weakest Link to Global Victory? Asian Americans: Educating the "Model Minority"
Joel Spring is a professor at Queens College/City University of New York and the Graduate Center of the City University of New York, USA.